In the first part of this series, I discussed some of the features of our Norseman 447 that are inherent to the design and build of the boat that we have come to know and love. 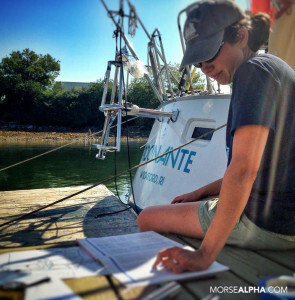 In this post I’m taking a look at a few of the items we have added to the boat to help make it our own, things we have found are working well and increase her general awesomeness factor. 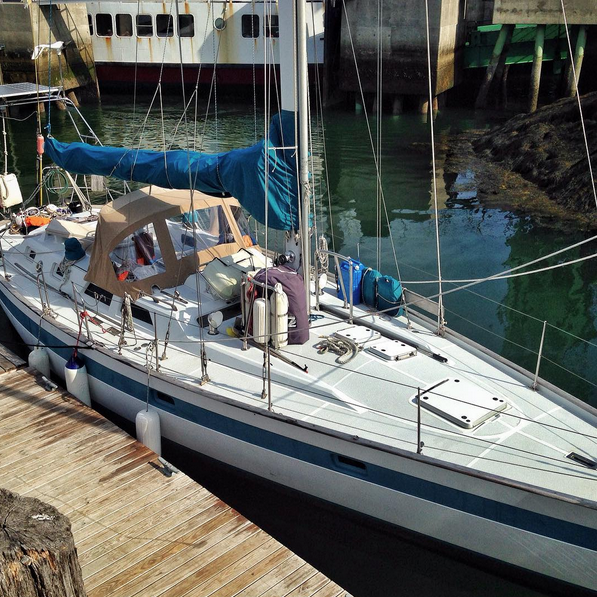 When we purchased Rocinante in Panama she had an autopilot, but no wind vane steering gear. We “auto-piloted” our way back to Maine, but boy did we use a lot of power. We had to run the generator each day for an hour or two just to keep up with the autopilot needs. We’ve owned 3 autopilots and each one of them has broken down at a time when we needed them. We had been spoiled in the past with our previous boats and their windvane self steering gear. Every boat we’ve owned thus far had a Monitor Windvane. After that passage without one, we now know just how important they are for the offshore sailor. We always knew, but now we really know! So this past summer, before we made our way south we decided to install a Monitor Windvane on Rocinante – our 4th one! Yup, we’ve had 4 of them now on 4 different boats, we love them and trust them. The servo-pendulum design makes so much sense. As the wind increases and the boat moves faster, the power of the servo-oar increases. We had some concerns about the center cockpit installation, and we’d never used a Monitor in conjunction with a wheel, but Mike at Scanmar assured us it will all work out well, and it did. We installed the Monitor ourselves, in the water — as per the instructions. You actually need to install it while the boat is in the water to make sure you get the positioning just right. A lot of people think the Monitor is too hard to use, or intimidating. It’s really quite simple. We recently made a video that explains how it works. Take a look and you will see that despite it’s seemingly complex construction, it is quite a simple device to set up and operate. Many sailors think they don’t work well downwind or in light air. But I challenge that assumption; it works well in all conditions, but does require a proper friction-free installation and some practice. In the end the Monitor will make you a better sailor. What can we say, it’s one of our favorite pieces of gear, and now we know after making a passage both with and without one on Rocinante, we’d never make one with out it again. 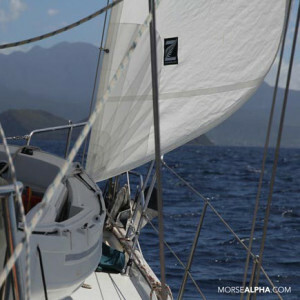 Ahh the dinghy… If the Monitor is the most important gear offshore, then the dinghy may well be the most important gear when sailing coastal. I’ve heard them called the station wagon of the cruiser… but perhaps ours should be called the pick-up truck of the cruiser… an F150 perhaps. There’s plenty of discussion about deflatables vs. hard dinghies. I’m not going to discuss that here. We prefer a hard dinghy, done. We loved our Fatty Knees 7’ aboard Elizabeth. We wanted another Fatty Knees actually. But during our research, we came across the Portland Pudgy. An 8’ hard dinghy purposefully built to take abuse… because that’s what dinghies do… they take constant abuse. They get left at concrete docks, dragged up beaches or rocks, and sit out in the hot sun every day. The Pudgy is built of rugged high quality, compounded, high density polyethylene. Perfect. The Pudgy is multipurpose… it’s a bit like a transformer. It’s a motorboat, a rowboat, a lifeboat and a sailboat. And it is thoughtfully designed and engineered. Every little detail has been addressed to function well in a variety of applications. It is really much more than a dinghy, it is an expedition boat… and we’re planning an expedition aboard the Pudgy! So keep your eyes out for that video! Subscribe to our Youtube Channel. Somewhat like buying a “dinghy-system-ala-carte”, we opted for the sailing system and the lifeboat system. We’ve spent a little time hanging out under the lifeboat exposure canopy, just to see what it’s like, sailed her around some tropical anchorages, and we’ve certainly rowed her full of groceries a bunch. I think what impresses me most often is just how much the Pudgy can hold and still maintain plenty of freeboard. We have had 4 adults, 2 kids and enough groceries for 5 days in the Pudgy, with room to spare… and we all stayed dry as we rowed out amongst the wakes and cresting waves. It’s our F150 for sure. I’ve always wanted a wood stove on board ever since I worked aboard the Lewis R French in Maine where they cook 3 meals a day on a wood stove. The smell of wood fire is just so dang romantic. I can’t help it. We looked longingly at The Little Cod and The Sardine wood stoves, but they are so expensive. So when we stumbled upon the Cubic Mini Woodstove built in Canada for a very reasonable price, we thought – THIS IS THE ONE! It is so adorable, yet so well built. This little stove is stout. It’s got all the bells & whistles of a larger wood burning stove, even a secondary combustion system, all miniaturized into a boat sized package. We mounted ours to the wall and on top of the storage pedestal for extra security. It’s almost as cute as Dory… almost. 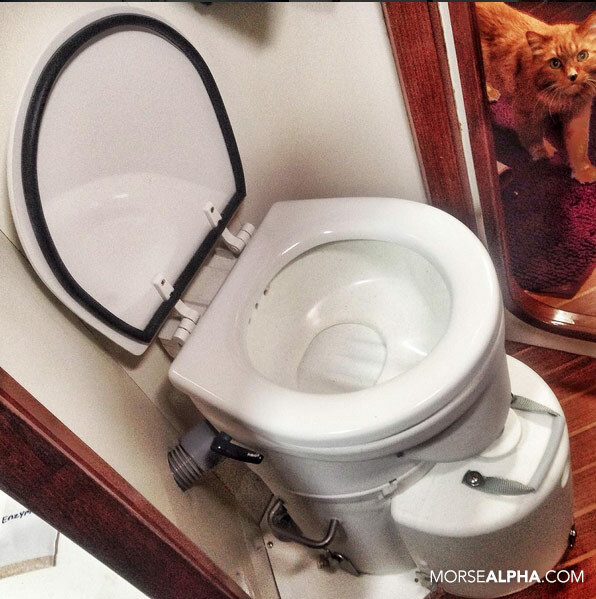 The idea of a composting toilet on board a boat is a bit strange. We don’t have a garden I kept thinking to myself, so why do we need compost?! But when we saw our friends Airhead, and the simplicity of the system, we realized it is a great idea to have on board. No longer did we have to worry about switching Y-valves, rusty hose clamps, pump rebuilds, old leaky & stinky hoses, pumpout facilities, and the best feature yet…two less thru-hulls! Ok great you say on paper, but how about in reality? Well after about 9 months of using the Airhead in a liveaboard situation, we still love it. Now, I won’t deny that it did take some time to perfect our techniques, and the very important PPR … that’s the Peet to Poop Ratio of course. But with anything new, once you get the hang of it, it’s easy. For us the urine tank needs to be emptied roughly every 4 days, and the solids tank (polite aren’t I?) about every 4-5 weeks. We are using coco-peat bricks… compressed, dried coconut husk that packs down into a very tight plastic wrapped package. Perfect for storage on a boat. We have about 15 on board, enough to last about 1 year or so. Would we buy one again? Yes. When we purchased Rocinante, she had very nicely cut-out Reflectrix pieces for each hatch that fit snugly inside each deck hatch and side port. A good solution for reducing cabin heat we thought, simple, cost effective. But we wanted something on the outside of the hatches that would not only keep us cool, but also protect our acrylic. 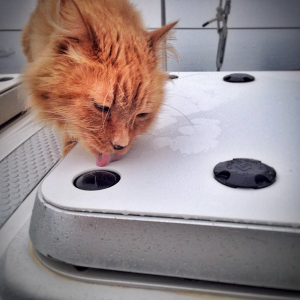 Outland Hatch Covers are made from white PVC that attach to the outside of your hatches with a patented twist lock fastener. We like these better then the alternatives like CloZures, because not only do they keep the cabin cooler, they also save our acrylic from UV damage. It’s surprising more boats don’t come with these as standard equipment. They are simple and elegant. Outland Hatch Covers has a lot of boats in their database, but if not, they’ll build hatch covers to your specs. The Norseman 447 wasn’t in their database, so we took the measurements ourselves. Steve Outland sent excellent directions and walked us through the measuring process. When they arrived, they fit perfectly, looked great! Outland should go into the “boatox” biz because they took years off Rocinante! She looks so clean. Here in the tropics, they have been a huge help in keeping our boat cooler. We are now looking at adding Outland Hatch Covers to our other smaller ports because we like them so much. Simplicity has always been at the forefront of our minds whenever we outfit our boats. Cruising sailboats are inherently complicated machines. 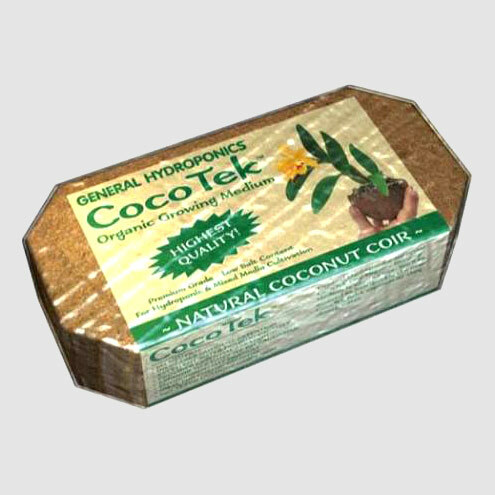 Our motto is to reduce complications wherever possible. Roller furling in our opinion is one of those places we can simplify. This year when we re-rigged Rocinante, we decided to remove the roller furling set up on the inner forestay, and switch to a hank-on stays’l. 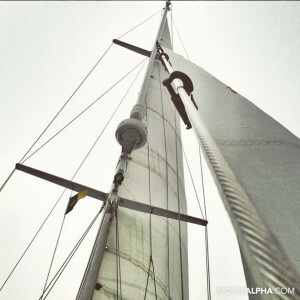 We were very intimate with hank on sails… all our previous boats were 100% hank-on. I know what you are going to say…but they were small boats, and hank-on sails are much easier to deal with when small. And right you are! So with that in mind, we swapped our smallest sail, the stays’l, to hank-on. It’s very manageable, not out at the end of a bowsprit, or right at the bow and it’s pretty small. It’s peace of mind factor is a solid 10. I know when I need to set it, it’ll go up, and when I need to strike it, it won’t snarl. That roller furled stays’l adding so much friction that tacking the genoa was nearly impossible without a trip to the foredeck to help pass it. Removing the rigid furling foil on the inner forestay also allowed us to make the inner forestay removable, thereby reducing the difficulty of passing the genoa during a light wind tack. We had our new hank-on stays’l sail built by Zoom Sails for a very reasonable price. But it all began with Jamie Gifford of Sailing Totem who offered excellent advice as we planned together the size and shape that would best suit our needs, and the boat. We could not be happier with the outcome. When the wind pipes up, we prefer to move our center of effort down and inboard. You can’t do that with a roller furling sail, the effort rises and moves forward. We’ve flown this sail by itself in 40 knots and kept the boat moving comfortably at 8 knots. Watch the video. You can join us on a Sail Training Expedition and see all these bits & pieces working in real life, and of course get some real sail training from two accomplished sailors who both have a background in education, and love to teach! We focus on safety procedures, good crew communication, using traditional navigation, sensible seamanship and of course fun. 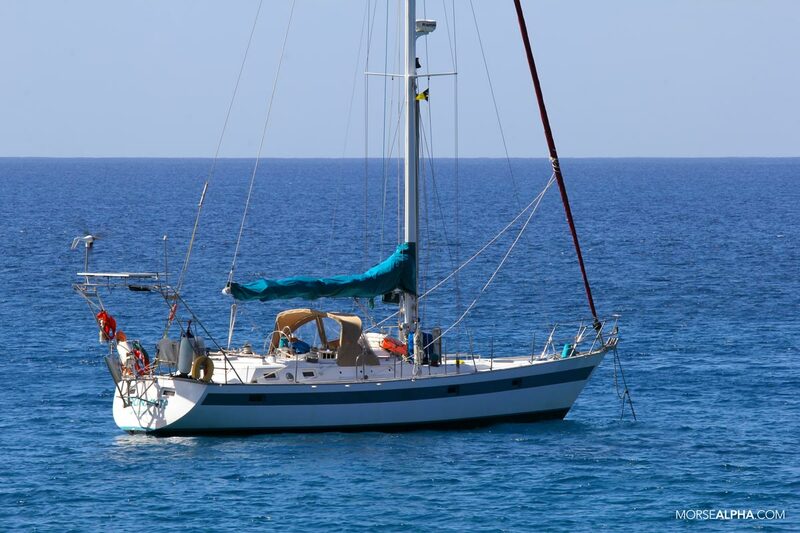 We offer offshore passages and coastal expeditions. Thank you, all those items are items I would want or consider for a sail boat. Some of them like the wood stove and compost toilet obviously have applications on land as well. I value your opinions and experience and your reviews on these are great places to start when I go to start putting together what I want in a sailboat. I save all these relevant posts (sailing at night, sail schools, book reviews, etc.) as a reference base I can go back in and search as I need them. Our other toilet is a Lavac! You could try configuring your toilet to dry out your droppings and used toilet paper and use them as fuel for your solid fuel stove, much like people in the third world burn dung,.. .. you’d lend a whole new meaning to Captains Log. We have a second head as well, so when we have more than 2 people we use both heads. I haven’t tried the airhead for more than two people. Maybe I should give it a try and see what happens! In the new boat I am again looking at installing only one head. Current choice would be a Lavac, but if I can avoid another thru hull, holding tank and hose, that would be nice. So any feed back from you or your readers on experience with only a composting toilet on longer cruises would be very welcome. I agree with your assessment of the Portland Pudgy. 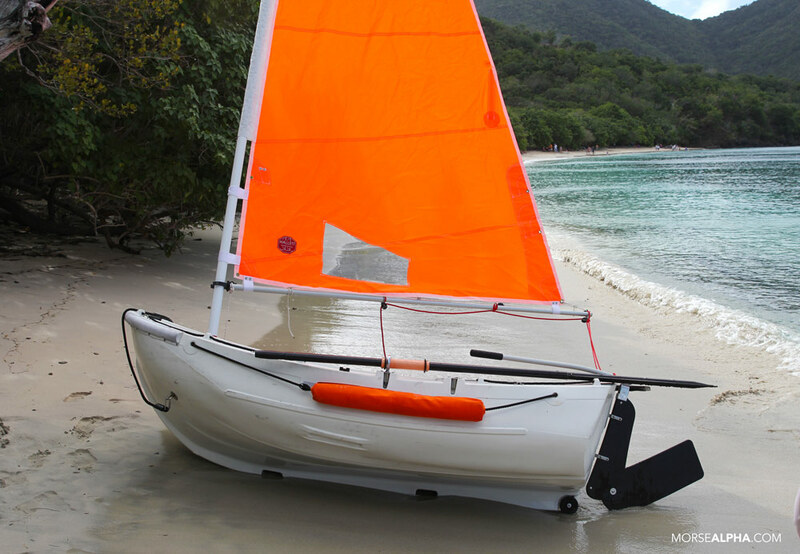 A great, functional and versatile dinghy. Great company too. Deb and Dave are so helpful and supportive of owners. They are wonderful! I agree. Nice stove,,.. makes a lot of sense financially too provided you primarily intend to run it on free bits and pieces, driftwood e.t.c,.. you can save both on heating as well as cooking fuel in the winter with the hotplate. 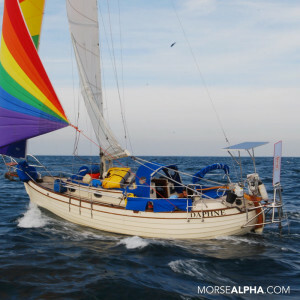 I was wondering though about wood stoves in a much smaller sailboat, say a 27 footer or thereabouts,.. …. would something like the tiny-tot stove be a good option. Great article as always! We also have an Airhead, and love it. One change I made this winter, in preparation for our 8-month cruise next winter, was to plumb a foot pump from the liquids tank to an existing thru-hull near the head. This will allow us to empty the liquids tank overboard when we’re in appropriate waters for that. Just stumbled onto this at the ironic time that I am installing an Airhead in the aft head of my Norseman 447. Great minds, etc. Since I am also addressing plumbing and holding tank Armageddon in the forward, I am thinking about a composter up there as well. Any reason why you didn’t go that route? The holding tank would not fit through any hatch, so removing it would not be an easily reversible solution. Very nice article by the way. 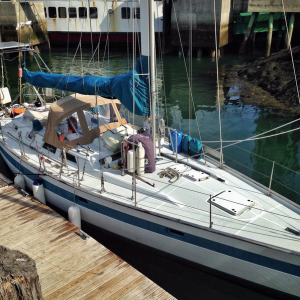 We are the new owners of Anna, N447 #53 and I need a great staysail like you describe. I inquired with Zoom for a quote but wondered if there are any additional modifications to your design that you would recommend? Also, where do you sheet it from? My staysail tracks are under the hard dodger. I assume you go to the genoa tracks when using it for high winds but please offer any advice. We plan to cruise south from Seattle in July 2017 and like you we LOVE the boat and the passion for the design expressed by the other owners we’ve met. Great job on the blog and maybe our paths will cross some day. Hello, love you simplicity approach. Couple of questions please. – if you had only one head, would you choose a Lavac or a composting toilet? – love the idea of a wood stove, but I am somewhat reticent given the fire hazard. It seems that with a diesel stove like a Refleks this would be less of an issue, or is that wishful thinking? I’m a big fan of everything you do. Thanks for this post. We are considering a Portland Pudgy for our new boat (an Outbound 46). I assume you stow yours on the foredeck while on passage? How does that work out? We’ve previously stowed a tiny inflatable, fully inflated, on the foredeck of our Sabre 38, which works fine. But the Pudgy has quite a big more freeboard and I worry about it interfering with the genoa and/or staysail.